The finals commenced with Duke (1-5 lifetime before this year’s event) taking on Seidel (0-5 lifetime at the NBCHU) in the best of three final. Duke won the first match, Seidel would tie it up in the second and held the lead in the deciding match, and had Duke all-in while holding the best hand, but his AdKd was no good for Duke’s Qd9d when she made two pair to take the lead. Duke eventually sealed the deal when her pocket nines turned a straight against Seidel’s A-2. Seidel was left with two outs to a chop, but the river was a blank, with the second place winnings of $250,000. Duke picks up $500,000 for the win, her first major win since her 2004 victory in the WSOP Tournament of Champions. Everyone left guaranteed at least $25k in pursuit of the $500k first prize. Click here for how they got to this point. WSOP Main Event champs representing. Where’s Varkonyi! By my count, that’s six Main Event champs, one Main Event-Europe champs, and one guy who thinks he was main event champ. Let the heads-up fun begin. Ali Nejad and Leann Tweeden called out the pairings at Pure in Caesars Palace last night. 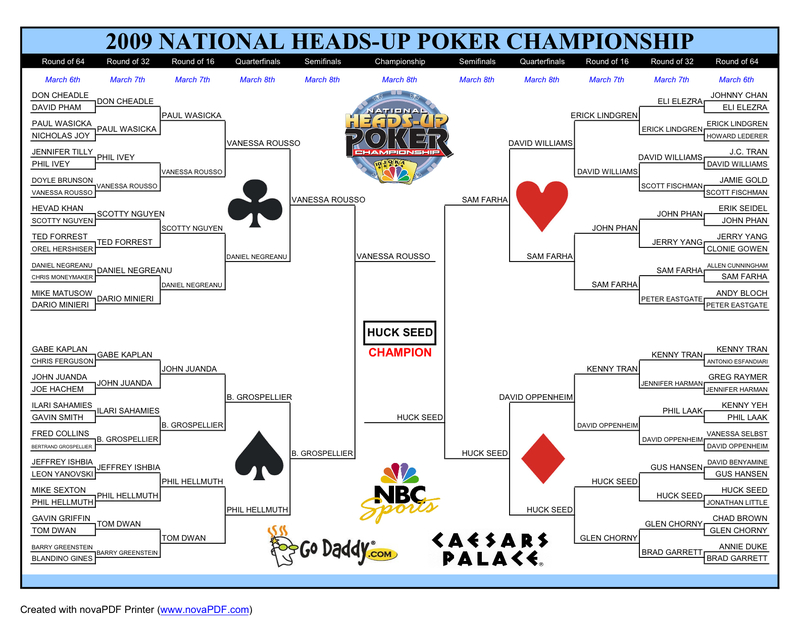 Here’s a print-outable PDF of the official bracket for the 2010 National Heads-Up Championship, which gets underway today at 1 pm pacific. Make your own picks via Pokerati’s bracket-tracker to see how our various predictions compare. We’ve got about nine five hours to come up with some sort of contest … a T-shirt is always standard, but I have to admit we’re running low on Pokerati shirts for really-really large men. We’ll be seeing the brackets for the National Heads-Up Poker Championship soon (drawing party is tomorrow) … and with some help from KevMath, I put together a list of who’s going to be represented at the mini-tables in this made-for-TV event. The list isn’t complete — feel free to let me know if we missed any representatives that are already settled and we’ll update accordingly — but it does give an interesting snapshot of where things stand in the competitive online poker landscape-dot-net circa early 2010. The list of who’ll be playing in the 6th running of NBC’s $25k heads-up extravaganza is out. The event runs at Caesar’s March 4-7. Fresh off her Sports Illustrated Swimsuit cover advertorial, followed by her GoDaddy spokesmodel deal (and Danica Patrick commercial), followed by her impressive run to a $250k televised cash at the NHUPC final-final table … Vanessa Rousso is back at her old stomping grounds, doing a monthlong, seven-stop, three-casino run through Florida — with lectures, seminars, charity tourneys, and a “series of instructional workshops grounded in â€˜Game Theoryâ€™ and Sun Tzuâ€™s teachings about The Art of War”. Ahh, now I see, her master plan kicked into gear with the PokerStars bikini shoot is all starting to make sense … she’s now got documented cred in looks, personality, skill … if only she could share her grasp of high-level contemporary mathematics and ancient eastern military philosophy with the troubled kids in her old hood! That put Shane “Shaniac” Schleger on reality-tilt and prompted a blog post entitled, “Seriously? AKA: The Award For Most Delusional Poker Player Goes To…” Though Shaniac tried to soften the blow of his words by saying that he liked Shorr personally, the post went on to list the reasons that Shorr was not invited to the NHUPC. In part, he wrote: “Shannon, get a grip. You should be ashamed for putting yourself in the same sentence as Le, Tran, and Pham, who essentially dwarf the entire poker tour community with consistency and moneymaking.